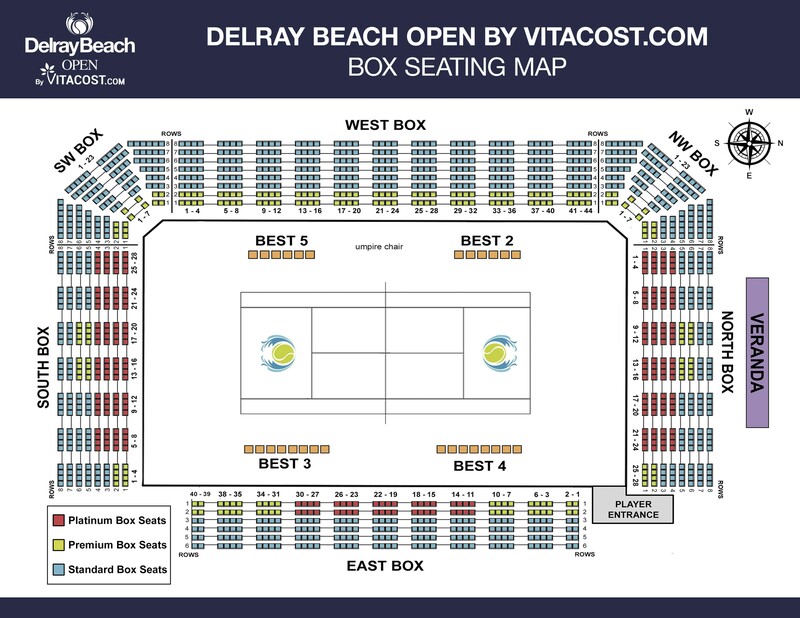 The Media Center is located in the Delray Beach Community Center on the NE side of the Tennis Center. Work stations and wifi are available. Click for Event Info. The on-line application for Credentials will be open on December 17, 2019. Credentials pick-­up begins Thursday, February 13 at 12:00 noon at the Credentials trailer in front of the Delray Beach Community Center on NW 1st Ave. A photo ID is required for pickup. Parking passes will be mailed to those approved for credentials. Media Parking is in the Green VIP lot in front of City Hall. Follow the signs from Atlantic Avenue. Bag searches will occur at the gate. “Wanding” may occur. Lockers are available for camera storage on a first-­come, first-­served basis. Media should bring their own locks. A PDF of the 2020 Media Guide will be available on the website 10 days prior to the event. After a match is completed, media will be notified whether interviews will be held in the Mixed Zone ground-level corral just outside the stadium’s NE corner or in the Interview Room, located in the Media Center. Mixed Zone interviews take place directly after a match while those in the Interview Room may be delayed for a player cooling off period (interview times are announced in the Media Center). Entry to both areas is limited to working media. 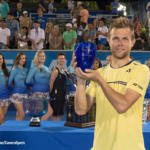 ATP rep Greg Sharko will bring players to all interview locations following matches of interest. Please fill out a request form with Sharko if you need to schedule an interview. Note: TV stations are limited to a reporter and cameraman in interview areas. ITWA members should request a credential for Players Lounge access. Photographers who apply for credentials must have a working assignment from a media outlet and must be shooting with a Pro-level camera or two camera bodies. 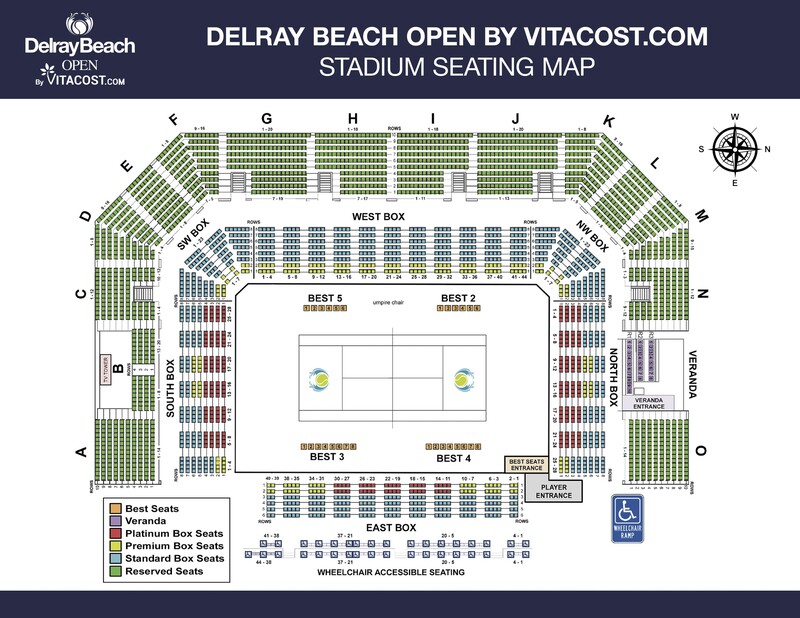 Still/video photographers with credentials coded “CA” (court access) will be permitted in the photo pit on the east side of Stadium Court, with priority given to dailies and wire services. A courtside shooting position is not guaranteed. If the area becomes crowded, it may be necessary to rotate positions, as determined by the media director or the official tournament photographer. •Photographers must access the west photo pit by walking against the back wall during changeovers. Return trips must also be made along the back wall. Access to the photo pit can be from either the north or south corral areas. •Photographers should not stand in the entrance way to the stadium court when players take the court, other than to gain access to the photo pit. •Photographers are to remain in the photo pit before and after matches, and off the court until the tournament-end Awards Ceremony. •Photographers must not speak to players, officials or ball kids at any time during a match. Requests made by the chair umpire are to be complied with immediately. No motordrives allowed before service, and flash equipment may not be used on the court during practice or matches. Strobes may be used for awards photos. •The official tournament photographer(s) will have the first photo opportunity during the awards ceremony. All photographers must remain on the opposite side of the net from the awards area. •Any photographer not adhering to the rules will be asked to leave.